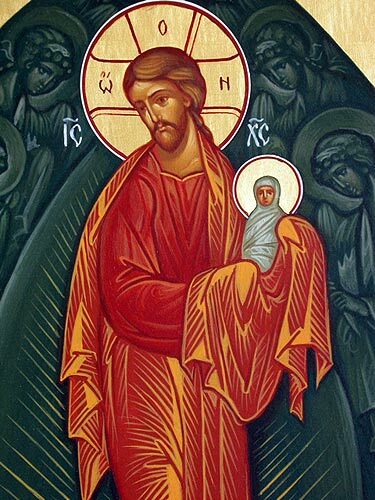 In a detail of the icon for the Feast of the Dormition (Fri. Aug. 15, 8am, at Holy Trinity) we see the Transfigured Christ (cf., Wed., Aug. 6, 8am, at Holy Trinity) holding the soul of his mother. The Dormition Fast begins August 1, focusing our gaze not only on the falling asleep of the Mother of God but of our own mortality as well. She is pictured in the icon of her repose, her body resting in death but her soul embraced by her Son. This image is exactly the reverse of virtually every other icon we have of her. In them, she embraces Christ as mother to Child. Now, he embraces her and receives her into his heavenly Kingdom. Virtually half-way through the fast, we will celebrate the Feast of the Transfiguration. Historically, it occurred “en route” to Jerusalem, to the Crucifixion and Resurrection of Christ. It was the literal mountain-top experience Christ gave Peter, James, and John, so that they might have a glimpse of his Kingdom before encountering his death and consequent triumph over death. So too, we glimpse the Kingdom, en route to the Dormition. It puts it all back into perspective for us: why Christ has come, who He is, and what He has prepared for all who love Him and await his Second Coming, it is his eternal embrace, as we see Him embrace his Most Holy Mother at her Dormition.